So you've got yourself some rare blue armour, maybe a bunch of purple Legendary armour but you're stuck on level 24 or level 29? In this tutorial I'm going to explain exactly how to increase your light level to the current maximum level. It takes the right mixture of armour pieces, Glimmer and some planetary materials for upgrades. Before I get into the details of exactly how to reach the top level 30, here's a recap of the Light Level system and the required Light levels for each. You increase your Light level by acquiring blue and purple armour, which can be upgraded further to push the Light level to the maximum stat for each piece. 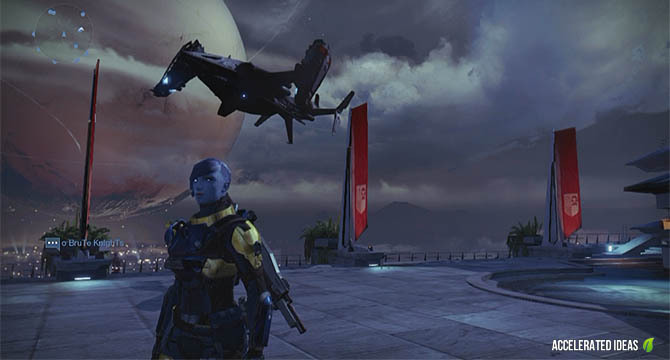 Remember blue armour has a smaller maximum than purple, and similarly a lower maximum than yellow Exotic armour. Blue (Rare), Purple (Legendary) and Yellow (Exotic) armour can be upgraded. Green (Uncommon) and white (Common) armour cannot. Equipping armour and playing the game for long enough will unlock upgrades for each of the armour pieces. The game will notify you when an upgrade is available and you'll see a green plus icon next to the armour piece. Each upgrade slot in the upgrade tree can only be purchased after the previous (left hand) item has been purchased. Blue upgrades require only Glimmer and plastic whilst purple and yellow armour require rare materials in addition to Glimmer before they can be upgraded. You'll find it very hard to upgrade yellow armour because of the need to acquire Ascendant Shards. If you're not sure which material you need to upgrade, you can either hover over the upgrade slots individually or hover over the Material Details button (shown above). Upgrade materials can be Spinmetal from Earth, Hellium Coils from Moon as well as other rare materials such as Ascendent Shards for the higher upgrades. Each armour type has a base Light stat and a maximum possible Light stat. You'll have noticed that blue armour usually has a base Light stat of anywhere between2 and 14, and you can increase these pieces another 3 or 4 Light by unlocking upgrades. However, blue armour has a maximum Light stat of 15, meaning that it's only useful until Light level 24. After that you need to move onto purple armour pieces. Similarly Purple armour has a base Light stat of 18 or above. The light stat of each armour piece can be increased by unlocking the upgrade, spending Glimmer and an appropriate material to get the upgrade. Using this technique it's possible to push each piece of purple armour up to a Light stat of 28. Depending on your combination of armour pieces your character can be anywhere between Light level 20 and 30. The table below shows you the types of armour you will need to reach each of the Light levels. The second column shows you the light required to reach that level, and the third and fourth columns show you the possible armour combinations you need to get there. As you can see without at least one yellow Exotic armour piece, you can't reach level 30 and will be stuck on 29. Similarly, you need at least one purple or yellow armour piece to reach level 25 otherwise you'll be stuck on level 24. Note: Iron Banner 2.0 now includes Armour which can help you reach level 30. See further down for details. Those that have completed the Raid will tell you that rewards from the Raid are slightly different to ordinary Legendary armour (shown in the table above as RPurple). This is because Raid gear has a maximum Light level of 30 which puts it on par with Exotic armour. 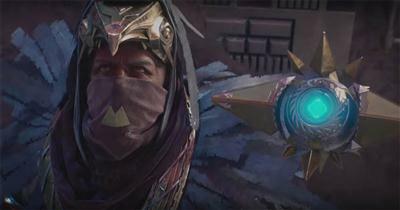 Therefore, whether you look for Exotics or get Raid gear, one of the two are required to reach level 30. Please note, with the introduction of Iron Banner 2.0 you can collect new pieces of armour with the potential for level 30 stats, see below. Bungie made a few mistakes on the way to finalizing the Iron Banner. Thankfully starting in Iron Banner 2.0 you can buy Iron Banner Armour with the potential to upgrade to stat 30. 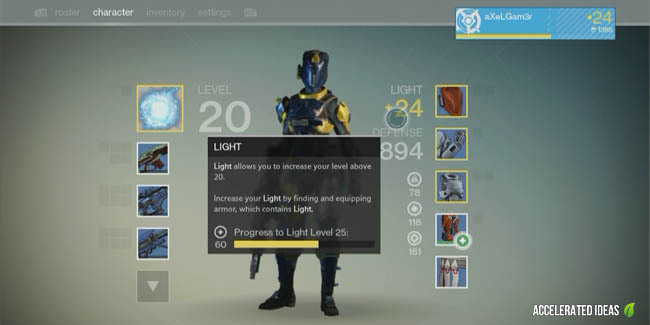 This basically means that you can acquire two or the three armour pieces needed to reach Light Level 30. However, it does mean that you still need to get one piece of Raid armour to complete the set. Remember you need one exotic and three armour pieces which can go to stat 30. For Titans the Iron Banner offers Iron Greaves. Warlock's and Hunters can buy Iron Boots. An Iron Banner rank 3 is required in order to unlock the purchase option from the vendor. Each of these will cost you just under 10000 glimmer. Titans can purchase Gantlets, Warlocks can buy Gloves and Hunters can buy sleeves. The rank is slightly higher with level 4 being required before the purchase option becomes available. Each of these will cost you just under 10000 glimmer. As with other factions in Destiny you can equip Iron Banner gear to earn bonus reputation from Iron Banner matches. It's only a small bonus, around 20% (depending on rank) but this makes a huge difference over a long time. To earn this bonus you need to buy and equip the Emblem and Shader which you should buy and equip as soon as you reach Rank 1. Secondly, you should select most if not all of the Iron Banner bounties to help you increase your Iron Banner Standing (reputation) quickly. There are now 10 bounty slots in your inventory so there's no need to worry about running out of space. Lastly, the Tempering buff which costs one Mote of Light will help you earn reputation faster. It's a consumable which lasts for 12 hours and becomes active as soon as you buy it.